Casts are cylindrical structures composed mainly of mucoprotein (the Tamm-Horsfall mucoprotein) which is secreted by epithelial cells lining the loops of Henle, the distal tubules and the collecting ducts. The factors responsible for the precipitation of this mucoprotein are not fully understood, but may relate to the concentration and pH of urine in these areas. 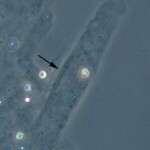 Casts may form in the presence or absence of cells in the tubular lumen. If cells (epithelial cells, WBC) are present as a cast forms, they may adhere to, and subsequently be surrounded by, the fibrillar protein network. A commonly-held theory is that cellular, granular, and waxy casts represent different stages of degeneration of renal tubular epithelial cells in a cast. 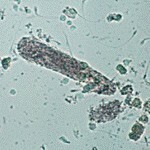 The appearance of a cast observed in a urine sediment depends largely upon the length of time it remained in situ in the tubules prior to being shed into the urine, as well as where it forms in the tubules. A cast recognizable as “cellular”, for example, was shed shortly after it was formed. A waxy cast, in contrast, was retained longer in the tubular system prior to being released (see image right). Casts can form at any levels within the tubules (proximal, distal, convoluted). Narrower casts are thought to originate from proximal or distal tubules, however wide casts are thought to originate from the collecting tubules or ducts. Note that the width of the cast may not indicate its origin as proximal or distal tubular dilation, e.g. tubular injury, can result in wide casts. Casts are quantified for reporting as the number seen per low power field (10x objective) and classified as to type (e.g., waxy casts, 5-10/LPF). Casts in urine from normal individuals are few or none (and are usually hyaline or granular in nature). An absence of casts does not rule out renal disease. Casts may be absent or very few in cases of chronic, progressive, generalized nephritis. Even in cases of acute renal disease, casts can be few or absent in a single sample since they tend be shed intermittently. Furthermore, casts are unstable in urine and are prone to dissolution with time, especially in dilute and/or alkaline urine. Although the presence of numerous granular or cellular casts is solid evidence of generalized (usually acute) renal disease, it is not a reliable indicator of prognosis. If the underlying cause can be removed or diminished, regeneration of renal tubular epithelium can occur (provided the basement membrane remains intact). Casts may be present in animals without apparent renal disease or tubular injury (hyaline casts, low numbers of fine granular casts). 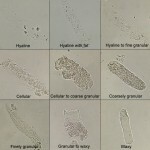 Of all these casts, hyaline casts (with or without adherent fat) may be seen in urine from healthy animals. Low numbers of finely granular casts may or may not indicate underlying renal pathology, because they have been identified in the urine of animals without apparent tubular injury, whereas cellular, coarsely granular and waxy casts (even in low numbers) always indicate renal pathology. Greater numbers of hyaline casts may be seen in association with proteinuria of prerenal (e.g., overflow proteinuria as in myeloma) or renal (e.g., glomerular disease) origin. In such cases it has been proposed that the presence of excessive serum protein in the tubular lumen promotes precipitation of the Tamm-Horsefall mucoprotein. Not all cases of proteinuria will have hyaline casts. Cellular casts most commonly result when disease processes such as ischemia, infarction, or nephrotoxicity cause degeneration and necrosis of tubular epithelial cells. The presence of these casts indicates acute tubular injury but does not indicate the extent or reversibility of the injury. A common scenario is the patient with decreased renal perfusion and oliguria secondary to severe dehydration. Ischemic injury results in degeneration and sloughing of the epithelial cells. The resulting casts often are prominent in urine produced following rehydration with fluid therapy. The restoration of urine flow “flushes” numerous casts out of the tubules. 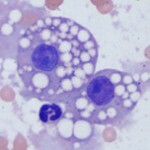 Leukocytes can also be incorporated into casts in cases of tubulo-interstitial inflammation (eg, pyelonephritis). It is rarely possible to distinguish between epithelial casts and leukocyte casts in routine sediment preparations, however, since nuclear detail is obscured by the degenerated state of the cells. Granular casts, as the name implies, have a textured appearance which ranges from fine to coarse in character. Since they usually form as a stage in the degeneration of cellular casts, the interpretation is the same as that described for cellular casts. 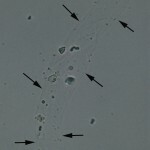 Low numbers of finely granular casts may be seen in the urine of animals without apparent tubular injury and have been reported after strenuous exercise in humans (where they still may reflect some tubular injury), so the presence of casts should be interpreted along with clinical signs, rest of the urinalysis results, biochemistry results and other pertinent diagnostic information. 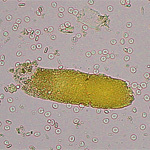 For instance, a few finely granular casts in urine from an animal without evidence of azotemia or renal dysfunction (e.g. no proteinuria etc) should not be interpreted as indicating “actionable” tubular injury since such casts can be seen in the urine of animals without obvious tubular injury or renal disease and may be a transient finding. Fatty casts are identified by the presence of refractile lipid droplets within the protein matrix of the cast. The background matrix of the cast may be hyaline or granular in nature. Fatty casts, like granular casts, are thought to represent tubular degeneration. 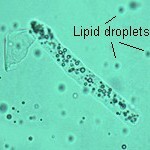 Note that the term fatty cast is not used for hyaline casts with fat droplets adhered to them (which are frequently seen in urines in which free lipid droplets are present as well). Pictured on the right panel in the image below is a fatty cast with a hyaline matrix. Also notice the free lipid droplets in the background. Fatty cast containing lipid droplets. 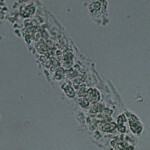 Fat droplets from a renal tubular epithelial cell in a cat. Free lipid can be a normal finding in animal urine (as an isolated finding, lipiduria is seldom of clinical significance) and is likely from degeneration of sloughed renal tubular or transitional epithelial cells. Shedding of these cells in urine can occur under physiologic (low numbers can be shed in healthy animals) or pathophysiologic (renal tubular injury) conditions. Once liberated from degenerating or ruptured cells, fat frequently sticks to hyaline casts. This may happen more in cats, because their renal tubular epithelium can normally contain small to moderate amounts of fat (see left image). Differentiation of true fatty casts from hyaline casts with adherent fat can be difficult and is based on the character of the cast matrix, rather than on the lipid content per se. 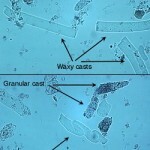 Waxy and granular casts in urine. Waxy casts are the final stage of cast degeneration (usually originating from cellular and granular casts). Compared to hyaline casts, they are readily observable because they have a smooth appearance, no internal texture, and are more refractile than the surrounding urine. They commonly have squared off ends, as if brittle and easily broken, and also have smooth parallel-sided borders. Waxy casts indicate tubular injury of a more chronic nature than granular or cellular casts, likely associated with low urine flow, and are always of pathologic significance. Red blood cell casts form when there is intrarenal hemorrhage and the red blood cells get caught up within the Tamm-Horsfall matrix. These are rarely seen in animals or human patients. Dysmorphic red blood cells have also been identified in human patients, but not animals, with intrarenal hemorrhage. When the red blood cells degrade within the cast, the cast can morph into a hemoglobin cast, which contains globules of hemoglobin. On a wet preparation, these casts mimic granular casts but have a characteristic yellow-red appearance from the hemoglobin (normal granular casts are colorless, unless they take on bilirubin stain in animals with bilirubinuria). 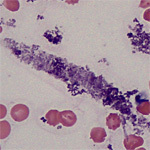 On a Wright’s stain, the hemoglobin within the casts is a muddy purple versus red color and, not surprisingly, does not stain positive with Prussian blue (which stains hemosiderin). Just like red blood cell casts, hemoglobin casts indicate intrarenal hemorrhage and have been associated with glomerulonephritis, acute tubular necrosis, renal ischemia (thrombosis, infarction) and other conditions. Hemoglobin casts (particularly waxy variants) can also be seen with hemoglobinuric nephrosis or acute tubular injury from intravascular hemolytic anemia. They must be differentiated from myoglobin casts, which is generally accomplished by finding evidence of rhabdomyolysis (high CK activity) versus intravascular hemolysis (hemoglobinemia and hemoglobinuria). The latter two casts have not been reported in animals. We have seen hemoglobin casts in a dog with suspected acute tubular necrosis from sepsis-associated disseminated intravascular coagulation (see images above and urinalysis album, cast gallery).